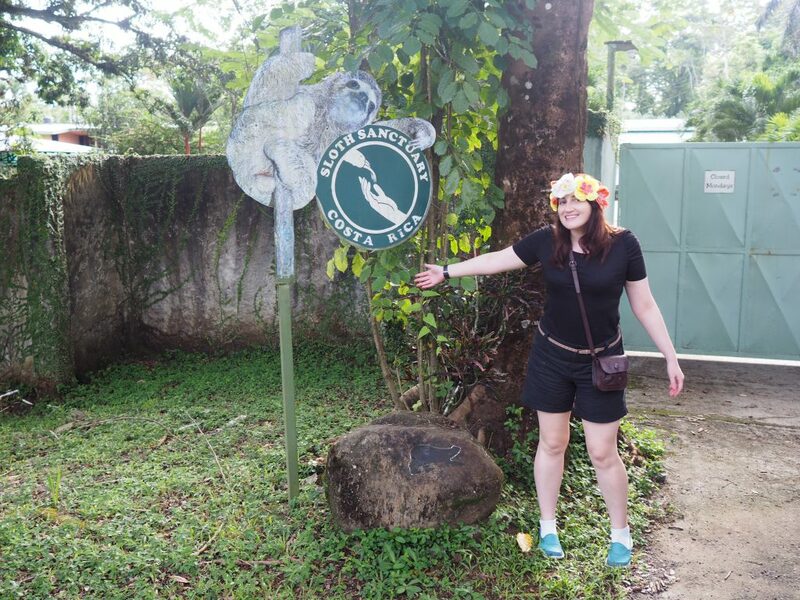 We had spent the night before frantically googling how we get to and from the Sloth Sanctuary (on sloth speed cruise WIFI) , whilst at the same time racking up a horrendous internet bill. It all seemed worth it, as today was the day that our cruise ship arrived at the port of Limon, Costa Rica. Our research led us to a taxi rank at the port. 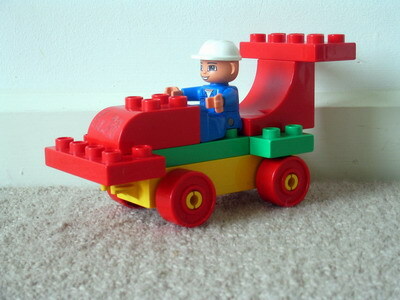 A series of red cars were lined up like they were about to race, with the drivers all wearing construction hats. They looked like they had come out of a lego duplo set. 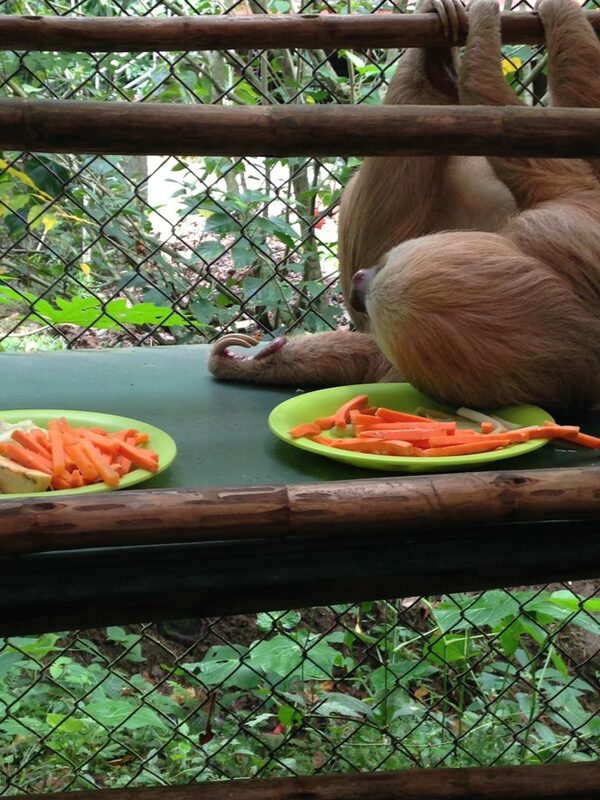 We walked over to one of the red taxis, and asked to be driven to the Sloth Sanctuary. The 45 minute or so drive was beautiful. 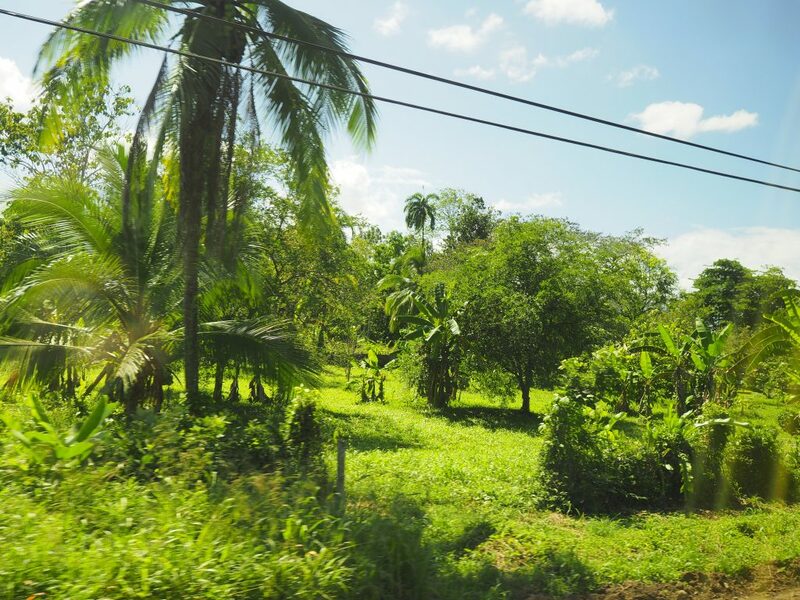 The road was surrounded by jungle on either side, complimented by regular glimpses of the Caribbean Sea. 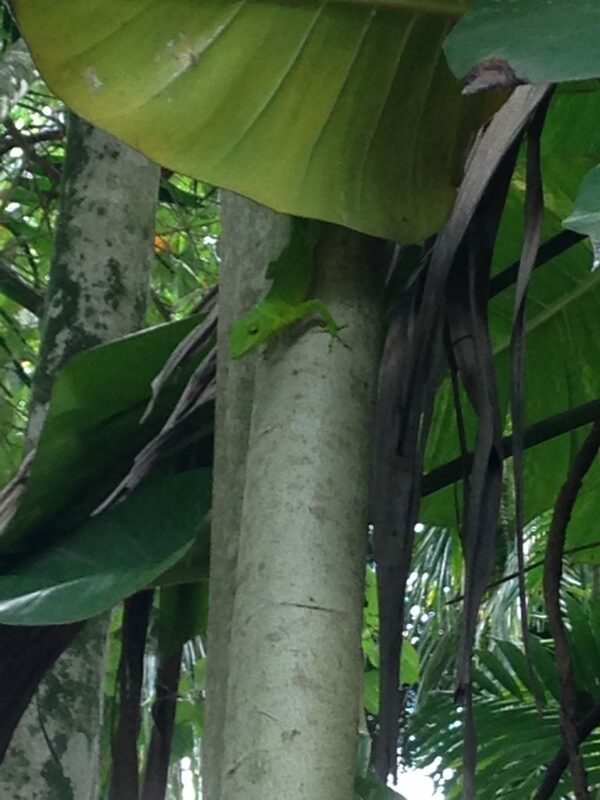 We were constantly on the look out for sloths in the trees. 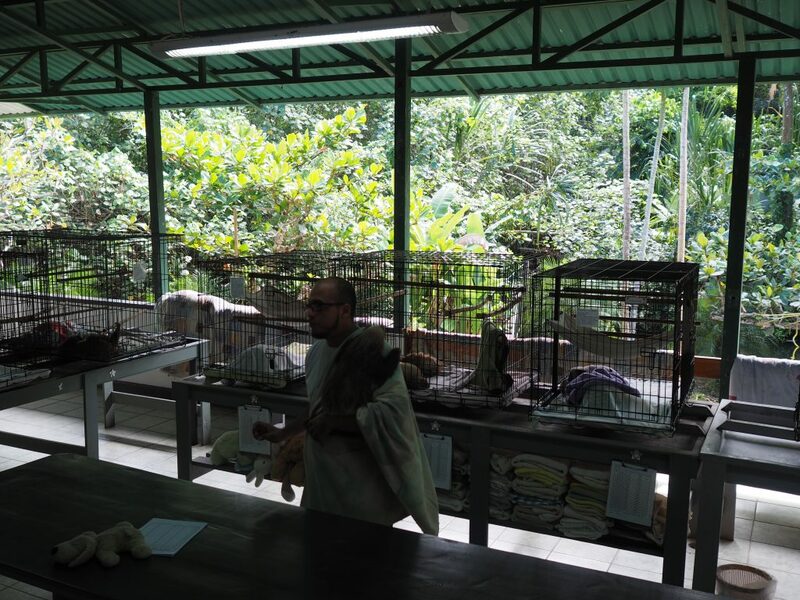 We were then taken to the “Slothpital” or sloth hospital where injured sloths are taken for examination. They had x-ray machines, IV drips, and basic scientific equipment for pathological analysis. 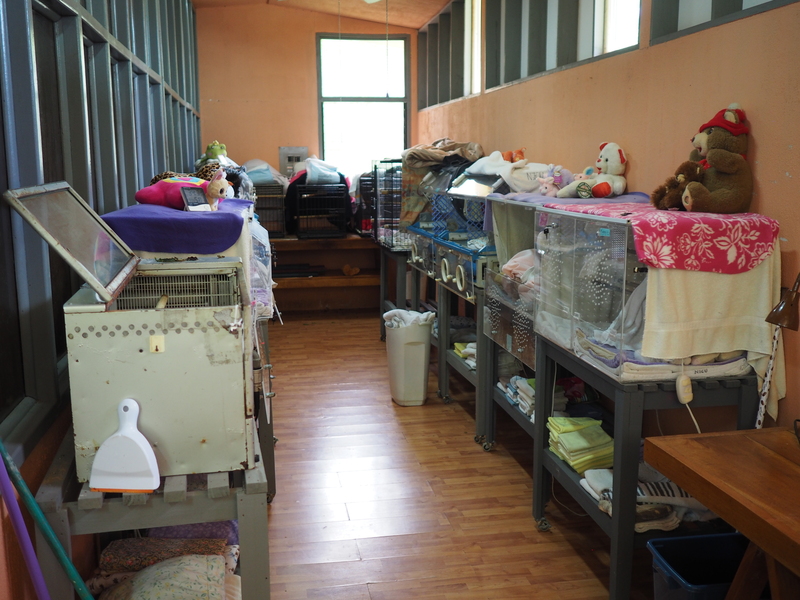 However, our next stop was by far the highlight of the tour, the sloth NICU (neonatal intensive care unit). 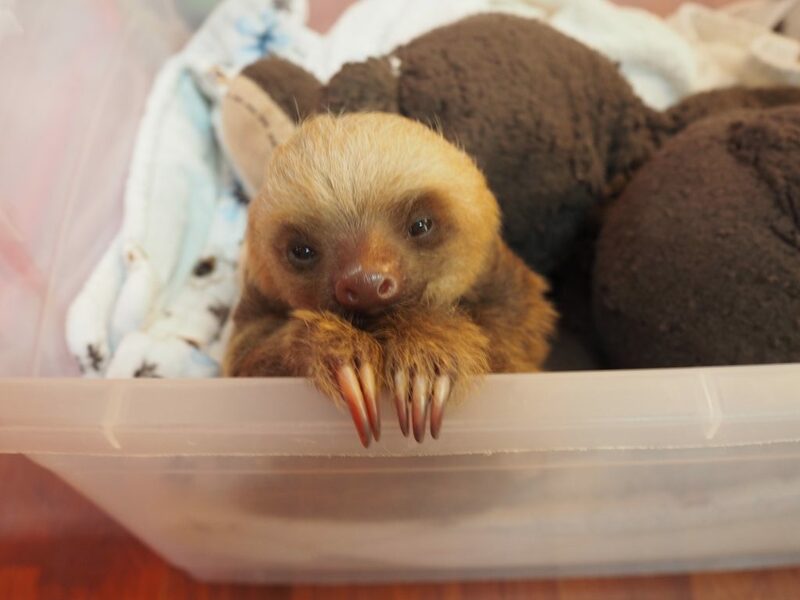 NICU, Sloth Sanctuary, Costa Rica. 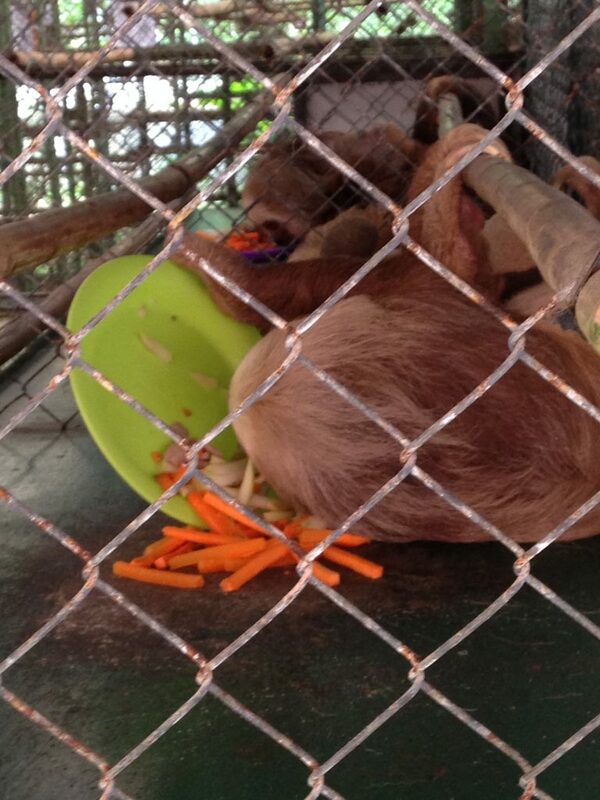 This unit was full of baby sloths who were new residents of the Sloth Sanctuary who needed to be monitored regularly. 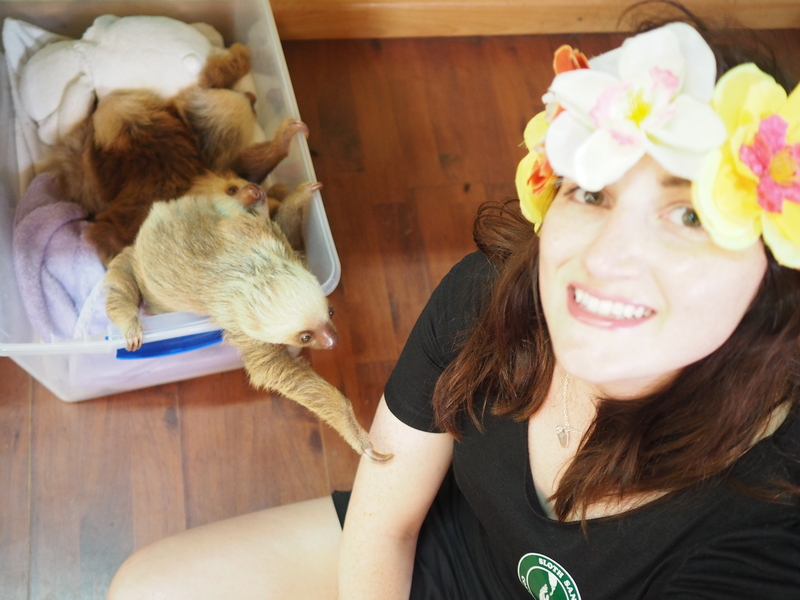 There were buckets of baby sloths. 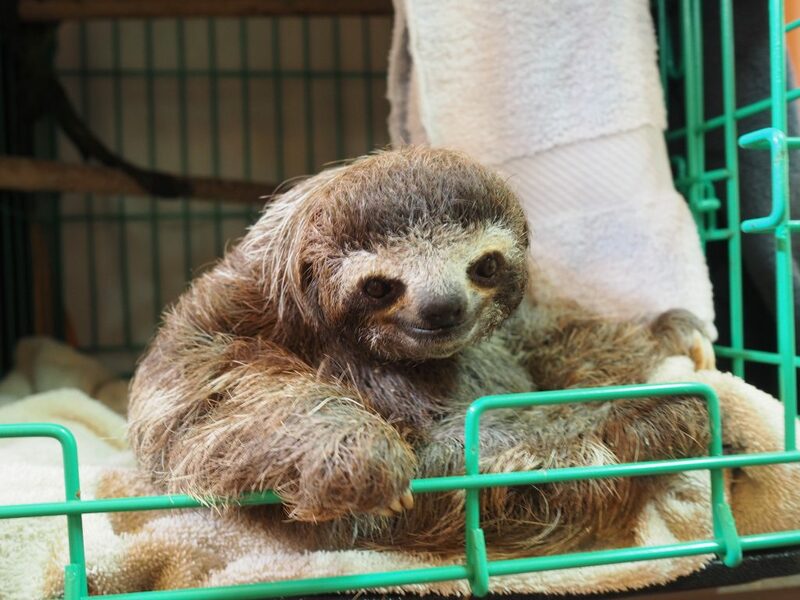 My favourite sloth in the NICU was Belle. 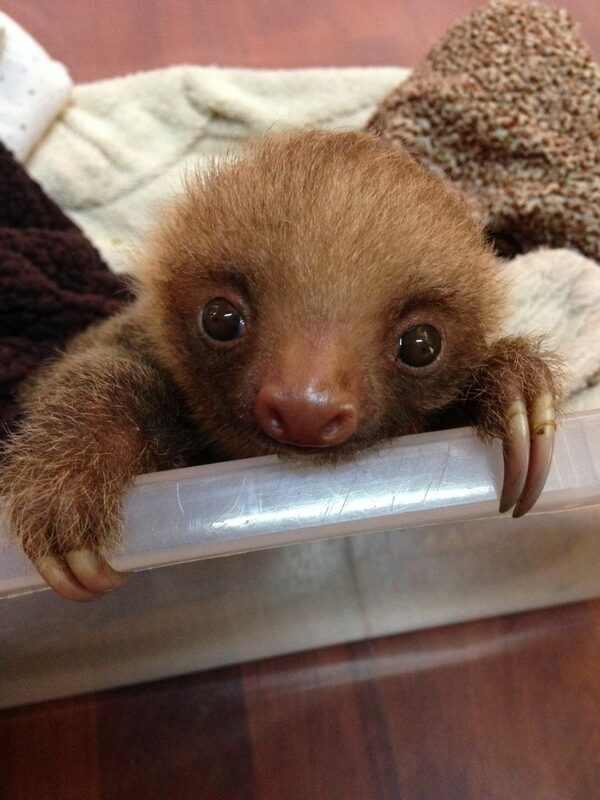 Belle the baby sloth, NICU, Sloth Sanctuary, Costa Rica. 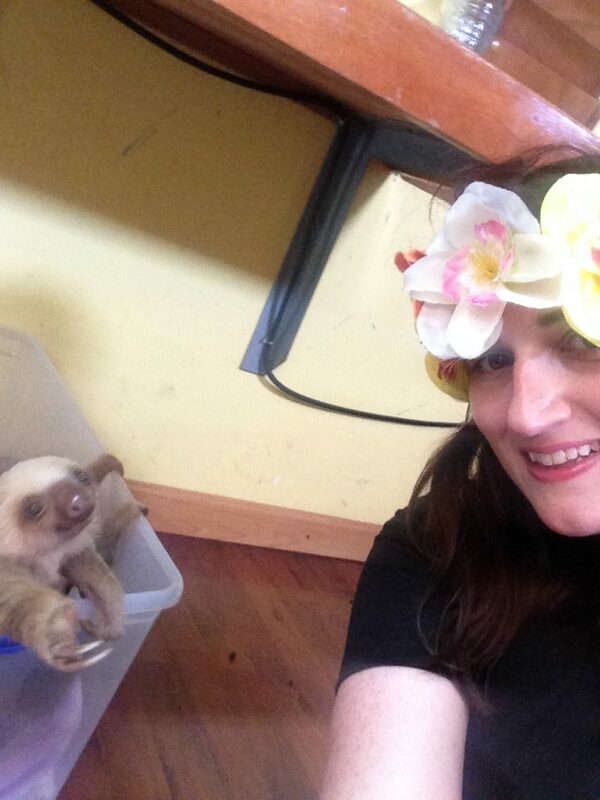 She was an incredibly cute and inquisitive Bradypus sloth who had noticed my hibiscus flower crown. As I sat myself next to her for a photo, she reached for my flower crown, touched it, messed up my hair in the process, and got her fingers caught in my hair. Belle obviously wanted me to adopt her and take her home. 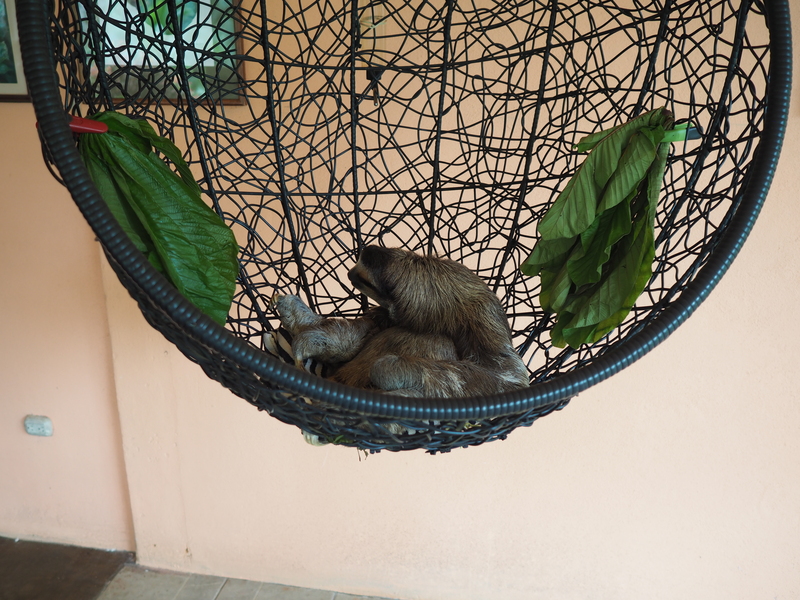 But alas, the tour guide was quick to respond and untangle Belle the baby sloth from my hair. 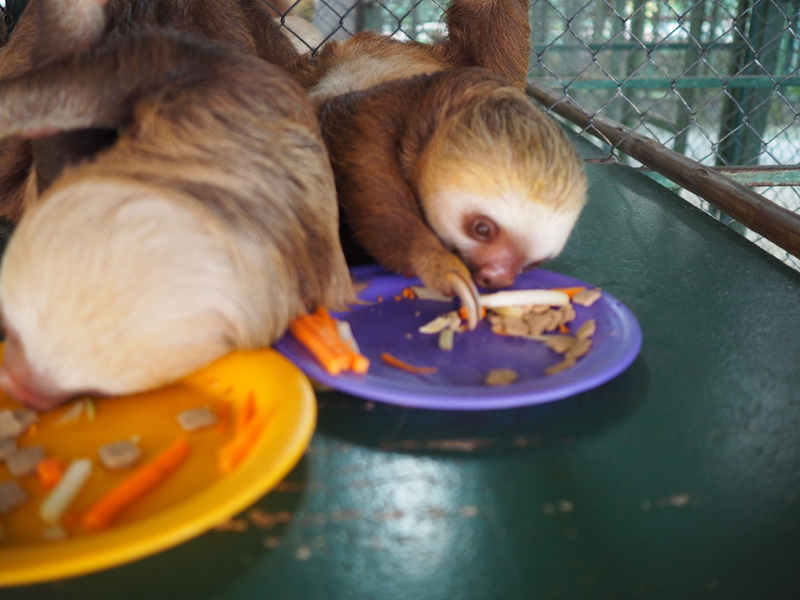 Note: Since coming back from this trip, Clint and I made a donation to the Sloth Sanctuary to sponsor four of the sloth residents, including Belle. 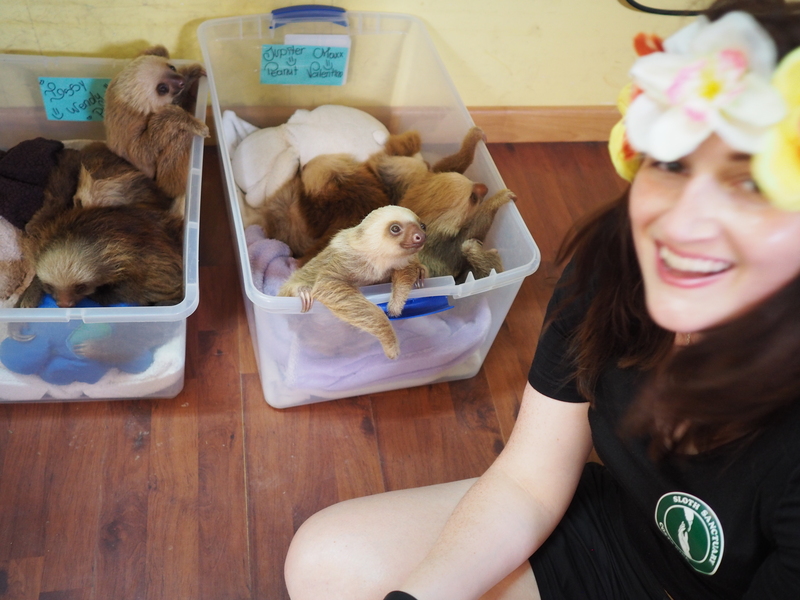 On the edge of a Kristen Bell style sloth meltdown, I continued to take many photos of these adorable baby sloths. 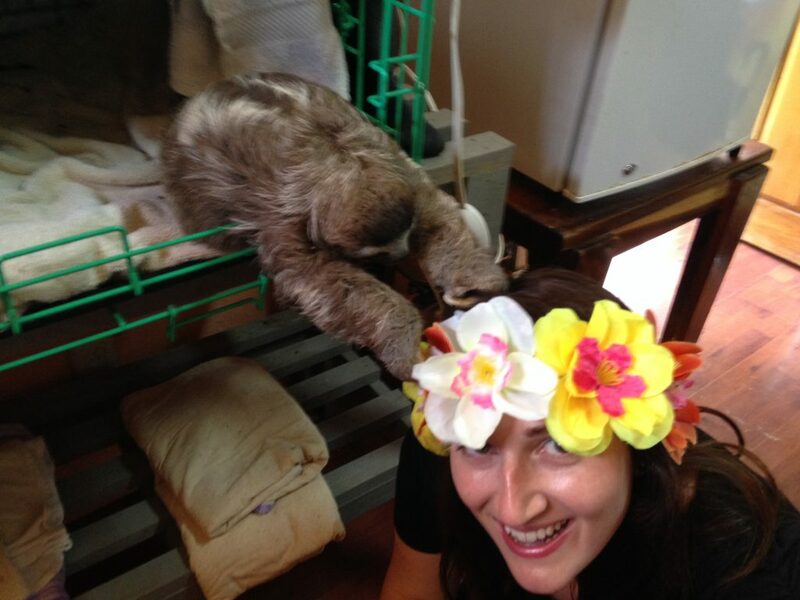 Another sloth, a cheeky Choloepus, also noticed my flower crown and reached out for it. 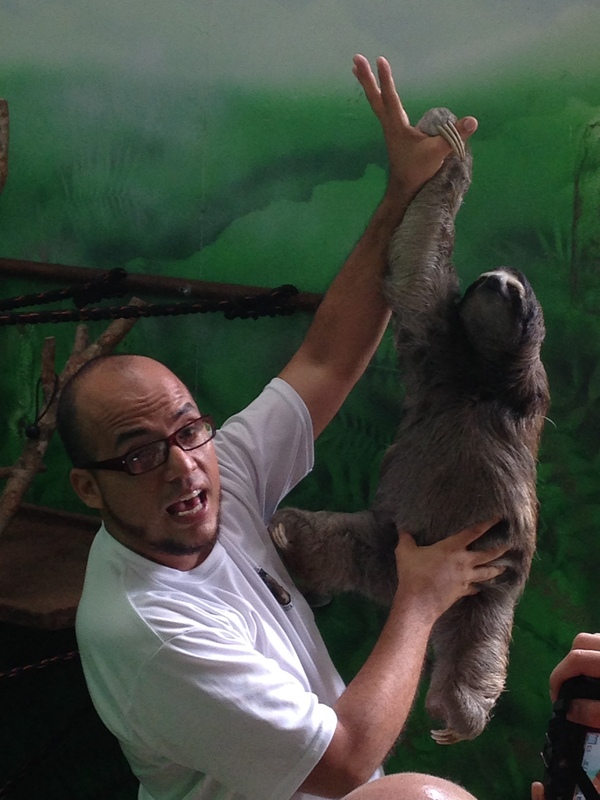 This particular sloth touched my arm and was attempting to climb up me like a tree. 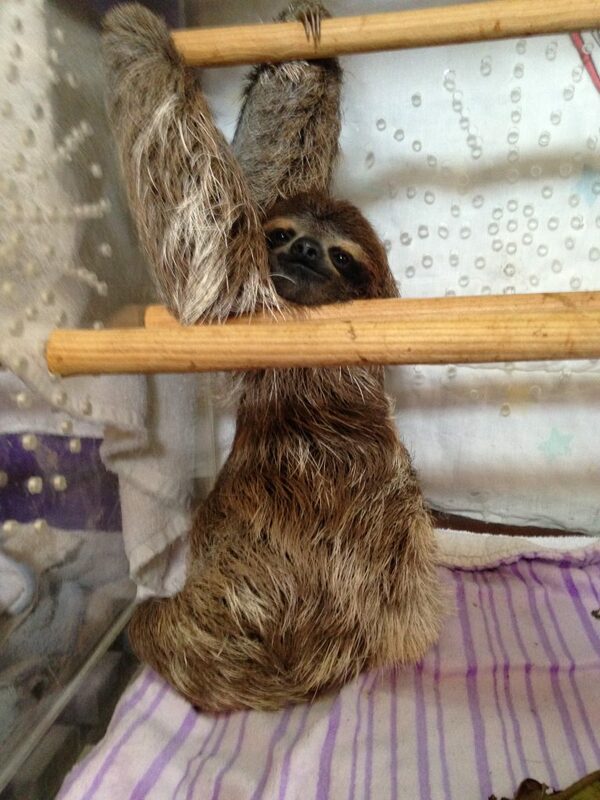 When I pulled away, the sloth chucked a tantrum and squealed. It was adorable. 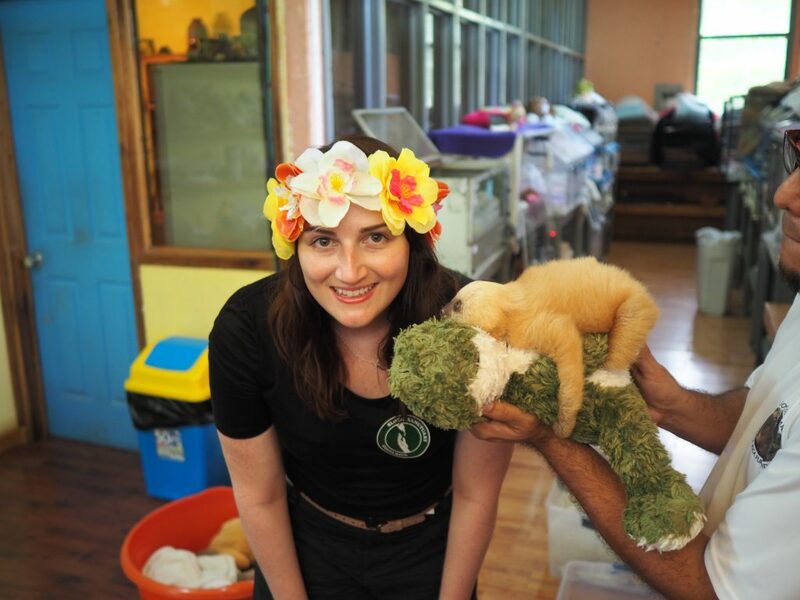 We then left the NICU and moved on to see the main star of the Sloth Sanctuary, Buttercup. She was perched on her special throne acting like a diva. 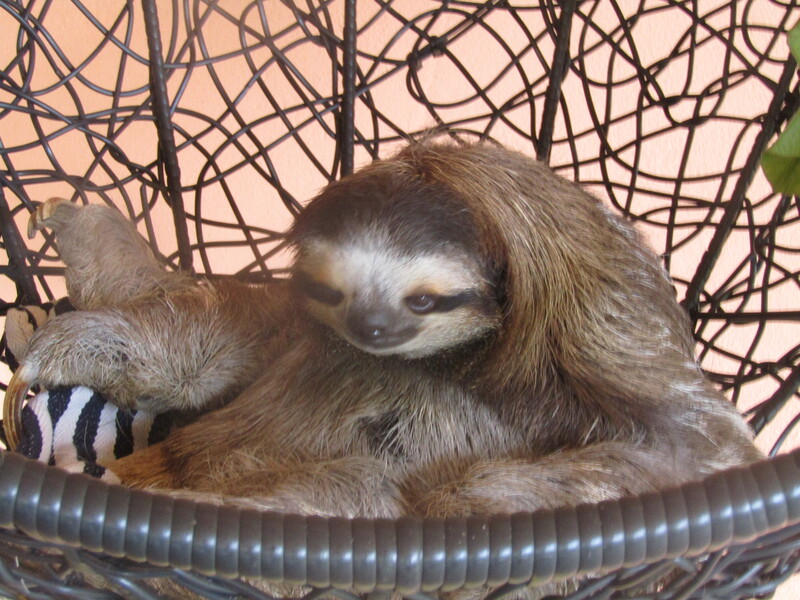 Buttercup, Sloth Sanctuary, Costa Rica. 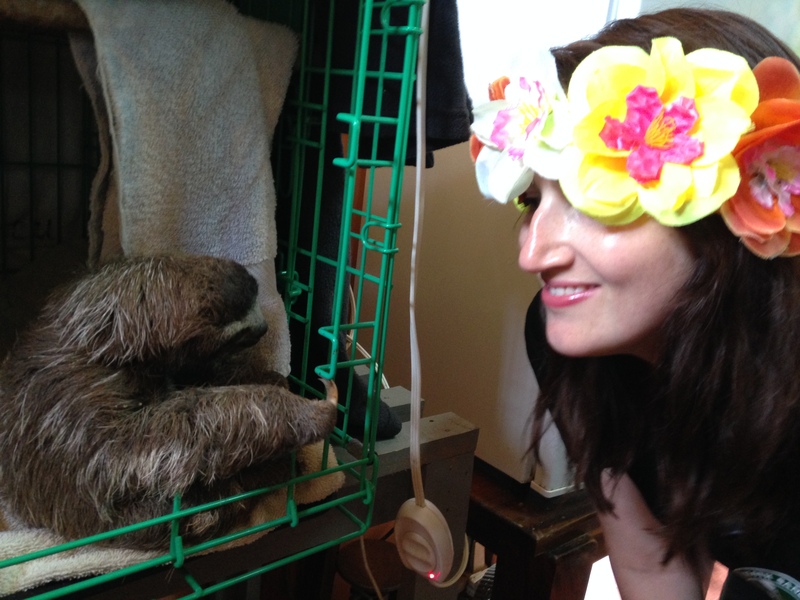 We also met other permanent resident sloths, including an amputee sloth named Toyota, before visiting the nursery. 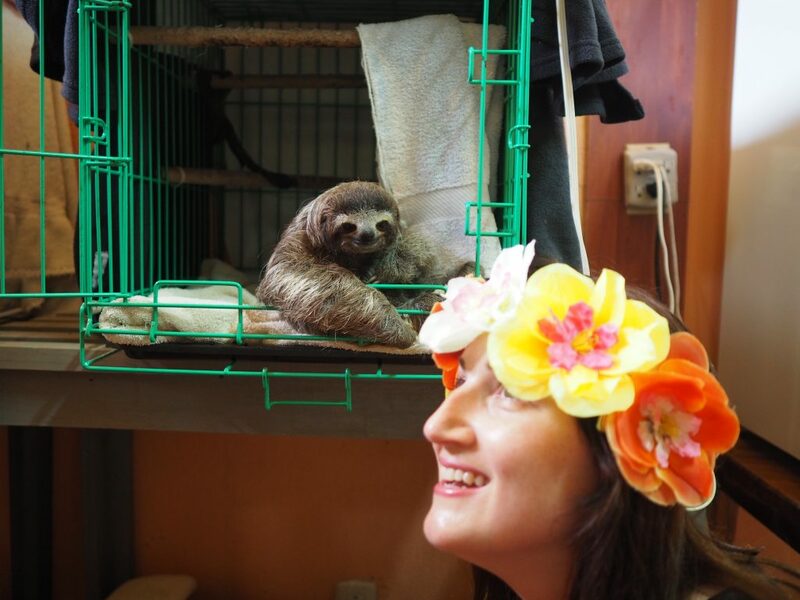 Toyota, Sloth Sanctuary, Costa Rica. 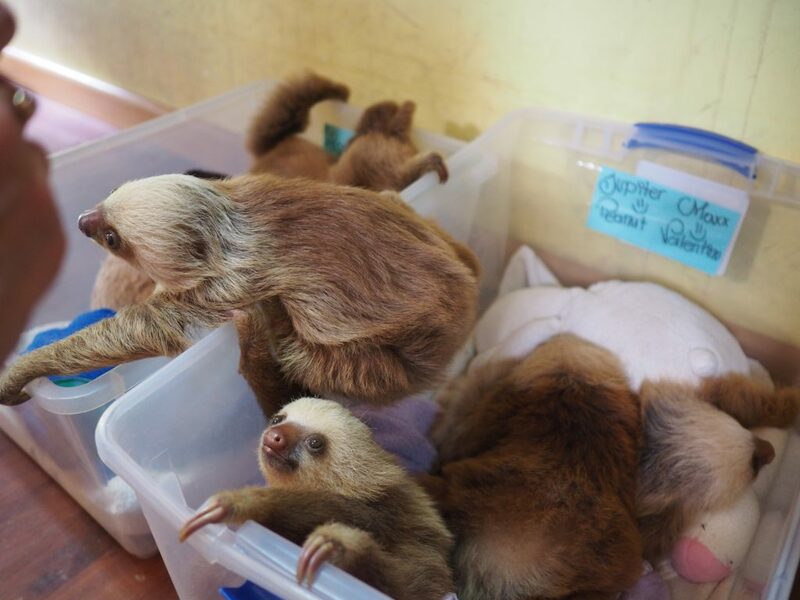 Nursery, Sloth Sanctuary, Costa Rica. 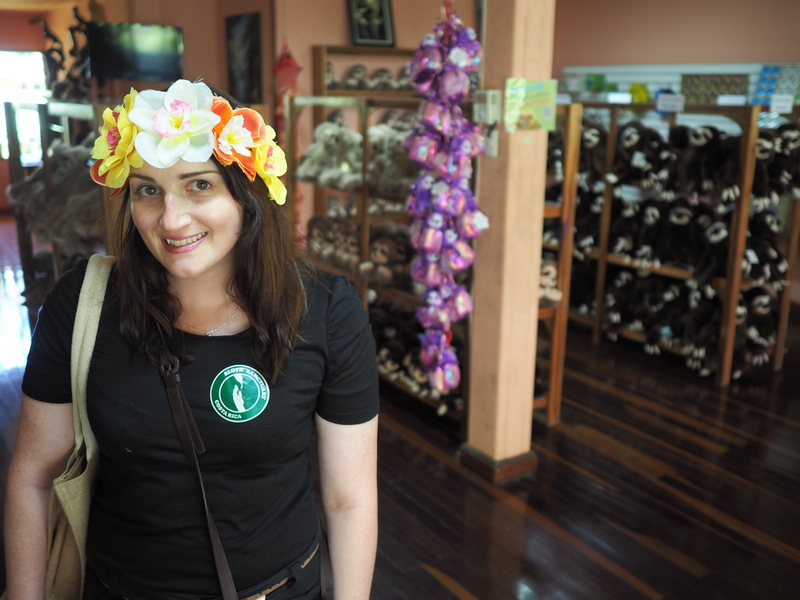 Following the tour we visited and purchased many slothy items from the (dangerous) gift shop. It was difficult not to buy the whole shop! 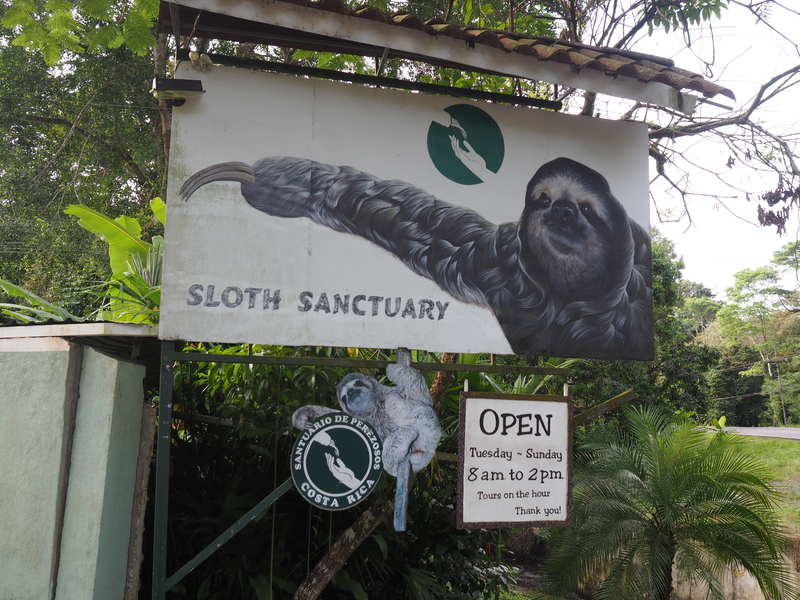 Gift shop, Sloth Sanctuary, Costa Rica. We chatted to the Queen of Sloths, Judy before her grandson drove us back to the ship on time for our back up shore tour. 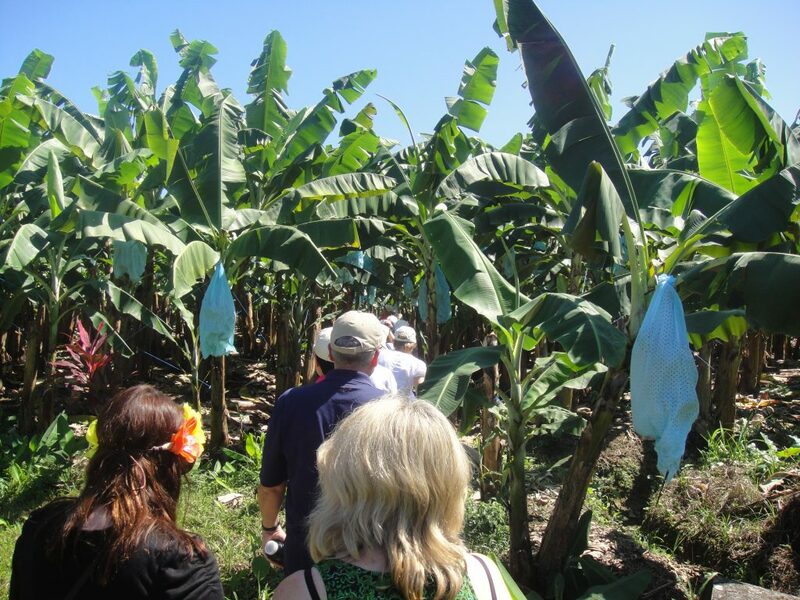 Our first destination on the shore tour was to a banana plantation. 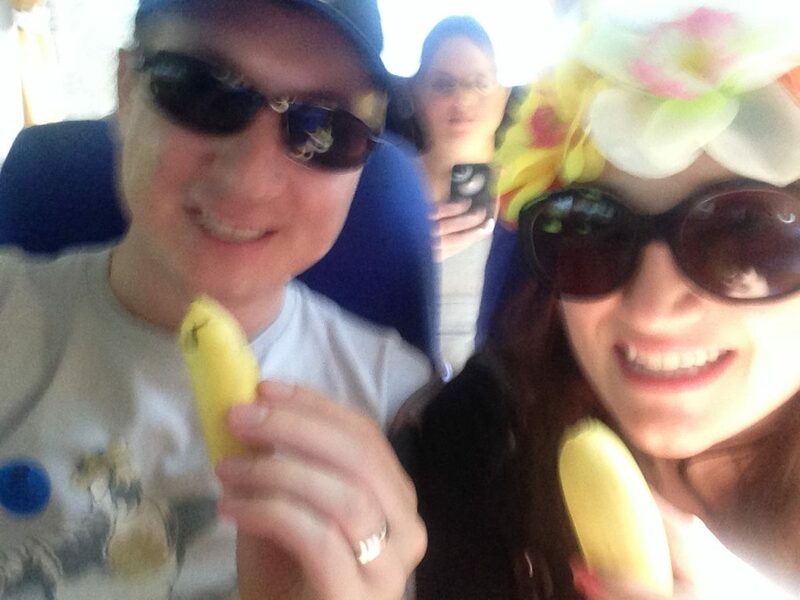 We were given the tiniest bananas to eat on the way. 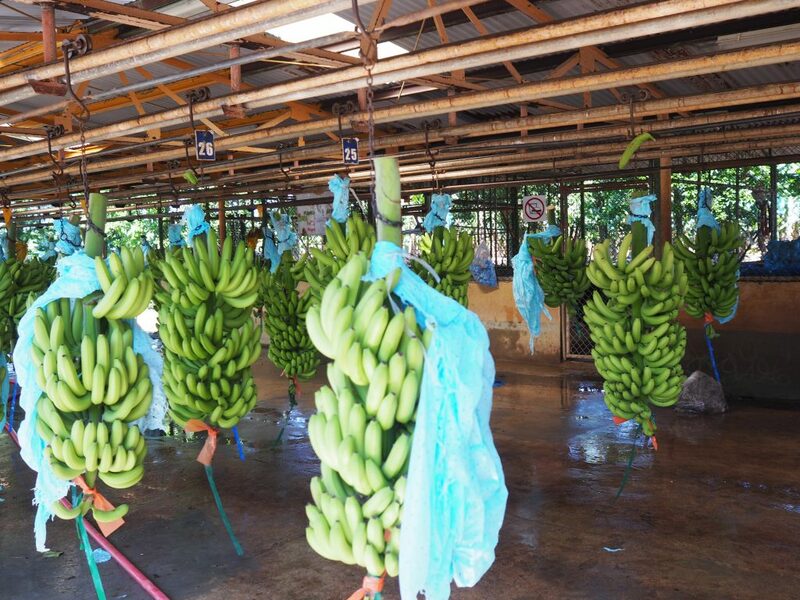 Costa Rican bananas, Costa Rica. 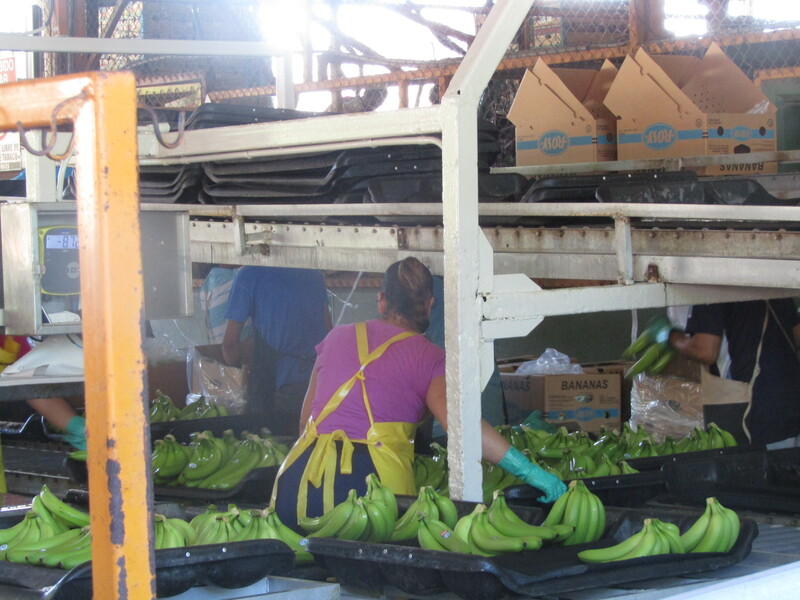 When we arrived at the banana plantation, we learned about all of the stages of the banana plantation process from growing to packing. Del Monte banana plantation, Costa Rica. 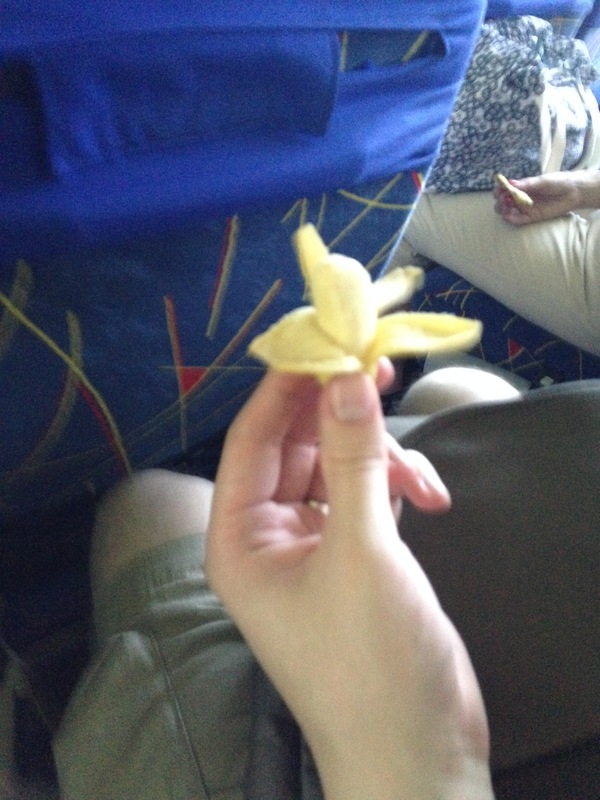 I was getting quite bored of seeing and learning about bananas. Everyone else seemed so excited and was taking their time looking around. Was I missing something? 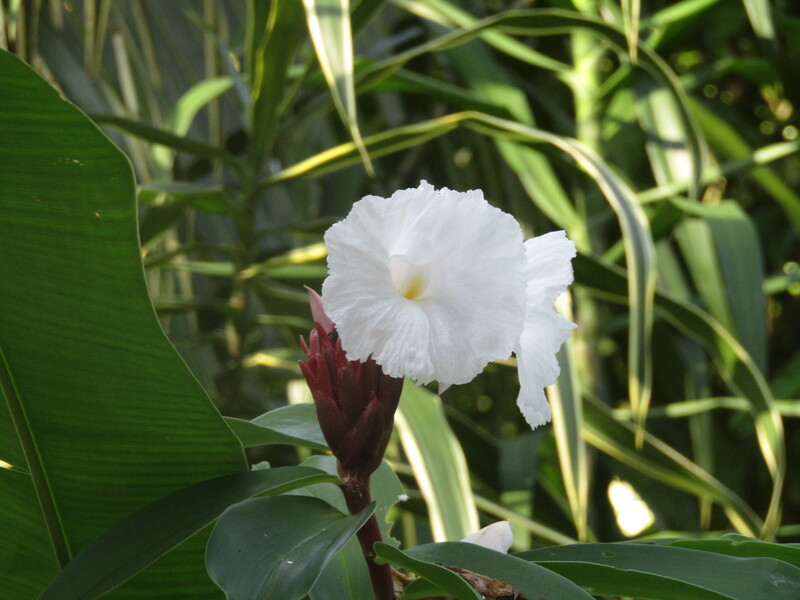 There’s only so many banana plants that you can look at in one day without losing interest. It was driving me bananas! 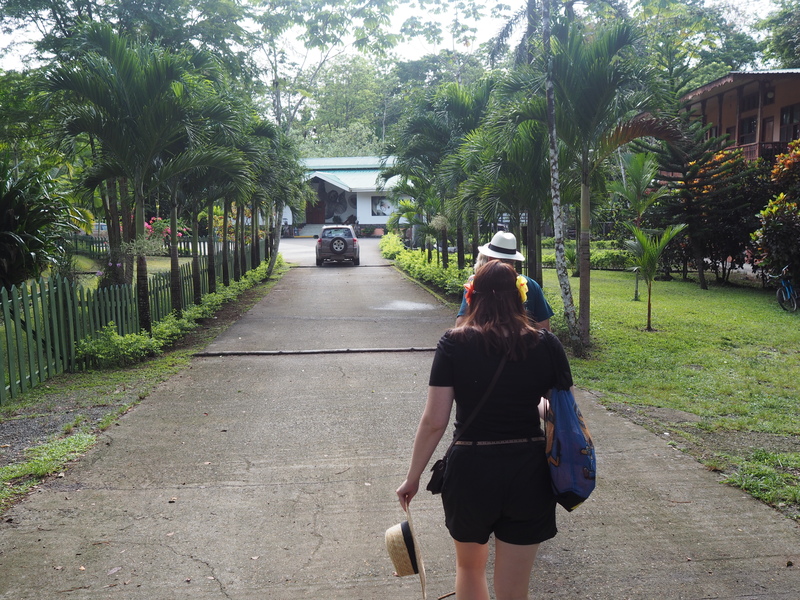 Our next stop was to a rainforest for a walk followed by a boat ride through the Tortuguero Canals. We saw many animals including a Jesus Christ lizard, howler monkeys, and sloths. 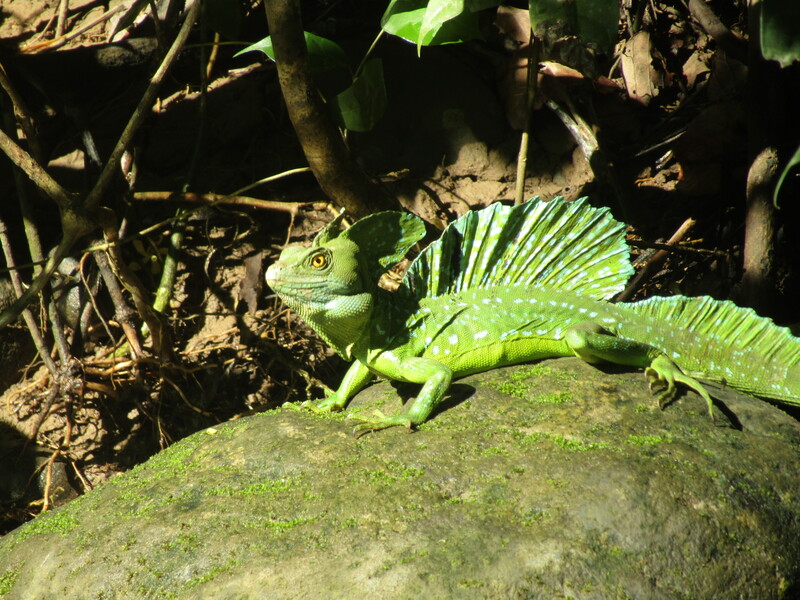 Jesus Christ lizard, Tortuguero Canals and rainforest, Costa Rica. 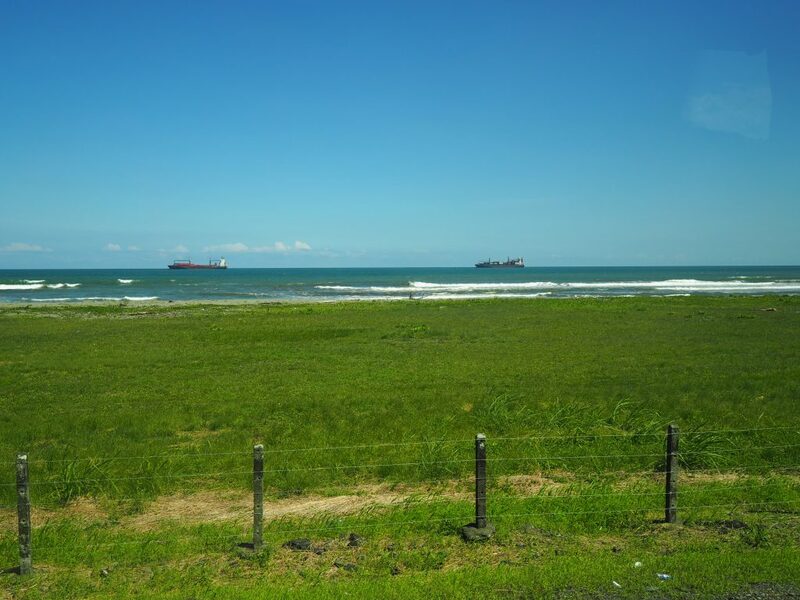 Tortuguero Canals and rainforest, Costa Rica. After a very long and exciting day in Costa Rica, we went back to our cruise ship. The excitement wasn’t over yet though. At dinnertime, the waiter surprised me with a cake to celebrate my recent PhD graduation. In addition to this, I was serenaded by a team of restaurant staff who gathered around our table and sang “happy graduation to you”at me to the tune of “happy birthday to you”. Everyone in the dining room was staring at me. It was a nice thought but at the same time mortifying. 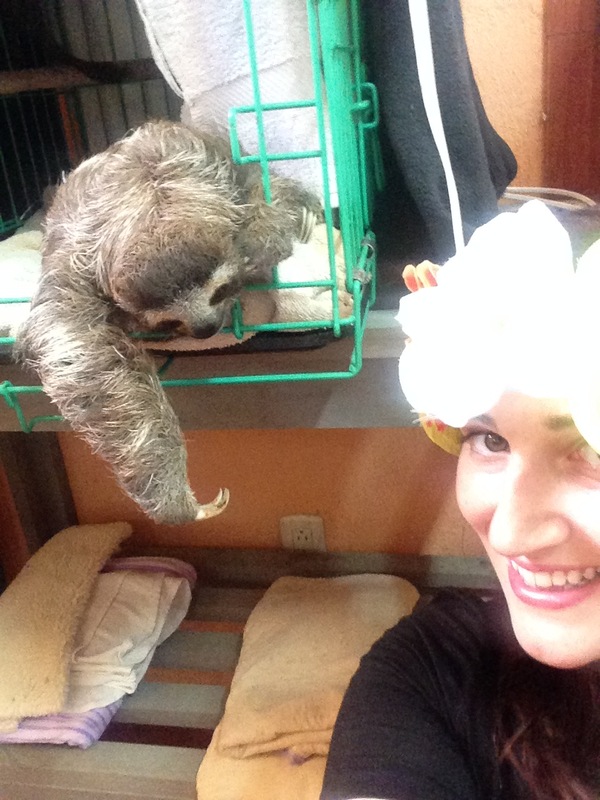 Today was a complete sloth style day at sea. I can’t remember doing anything else other than napping and drinking cocktails. We arrived at Ocho Rios, Jamaica. Everyone we met spoke like a Jamaican stereotype. I don’t know if they were putting on an act for tourists, or if they really do say “Yeah man!” at the end of every sentence. Mum and I boarded a bus ready for our shore tour. Dad and Clint boarded another bus for a different tour, which included bobsled riding (think Cool Runnings) and a water slide. On the way to our first destination, we saw a man on the side of the road selling hash brownies. We then saw another man pretending to be a tree as he hid in the bushes, known by locals as, “Jack in the bush”. He must have eaten some of those hash brownies! 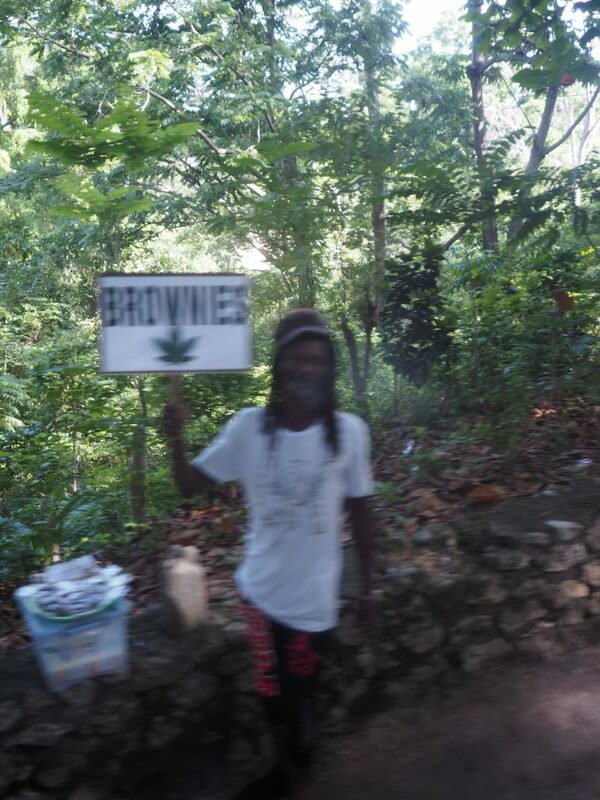 Hash brownies for sale, Ocho Rios, Jamaica. 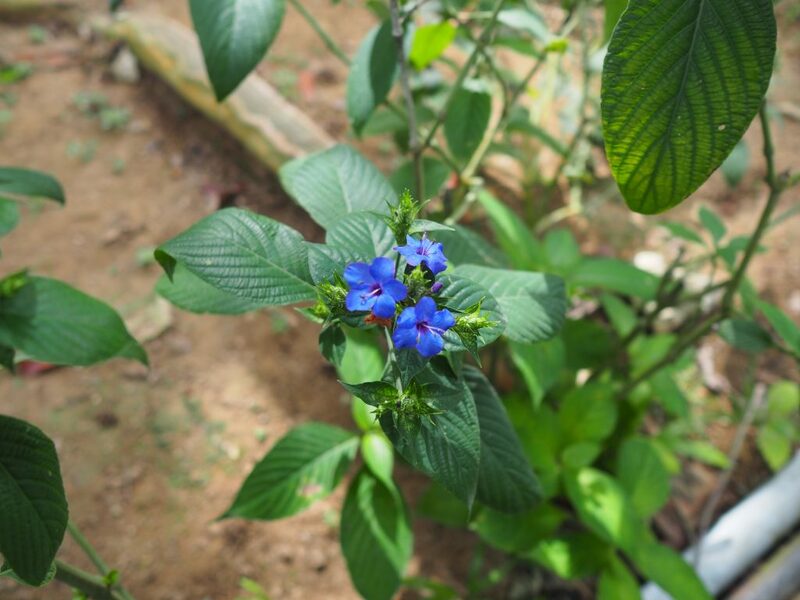 The first stop of our tour was to Shaw Park botanical gardens, a rainforest park with a spectacular cascading waterfall and surrounding gardens filled with native Jamaican plants and wildlife. Somehow, I thought that Havaianas were the most suitable footwear for this tour #Australian. This could only end badly. Shaw Park Gardens, Ocho Rios, Jamaica. 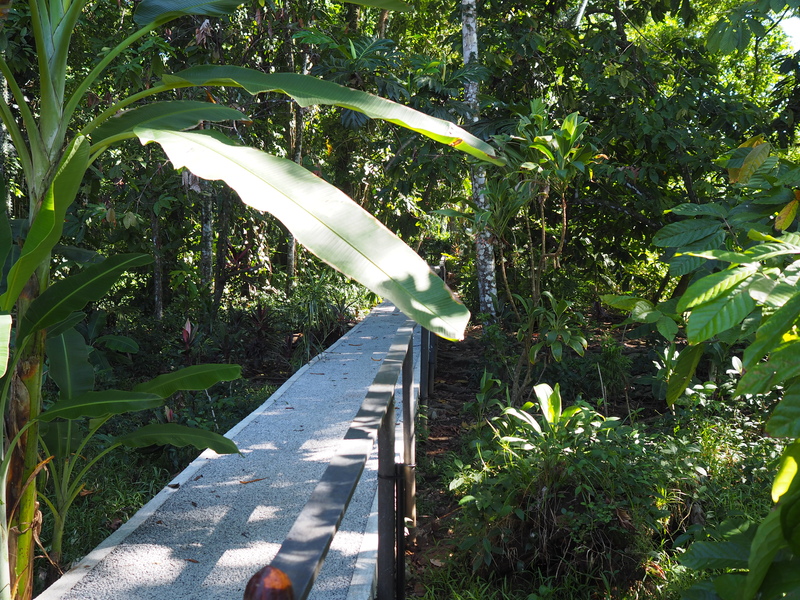 We met our Jamaican guide, Vincent, who took us on a tour of the park through the beautiful rainforest. Vincent, Shaw Park Gardens, Ocho Rios, Jamaica. 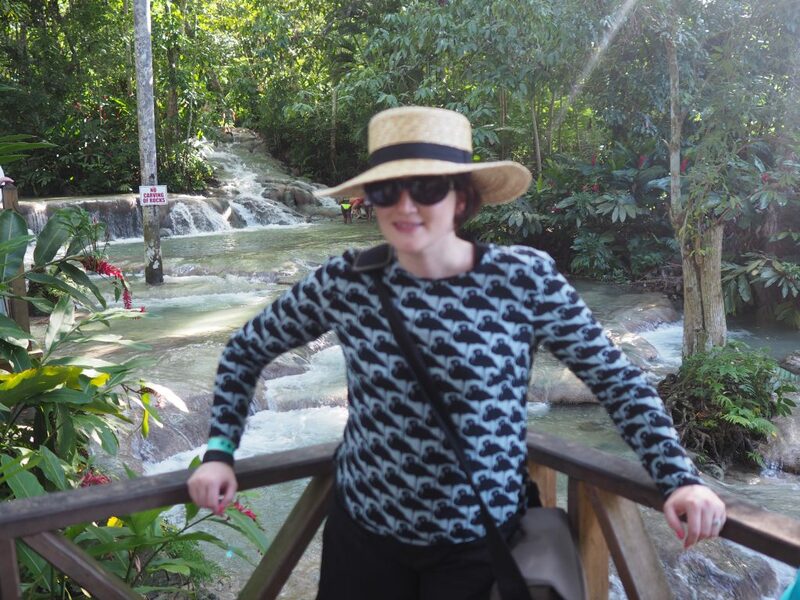 On the walk we saw a spectacular natural waterfall…. 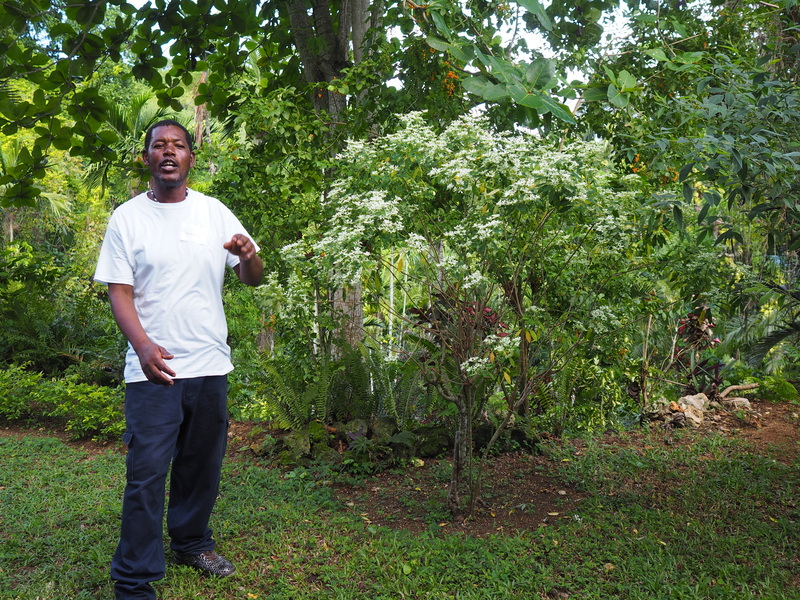 And Vincent showed us plants that were native to Jamaica. 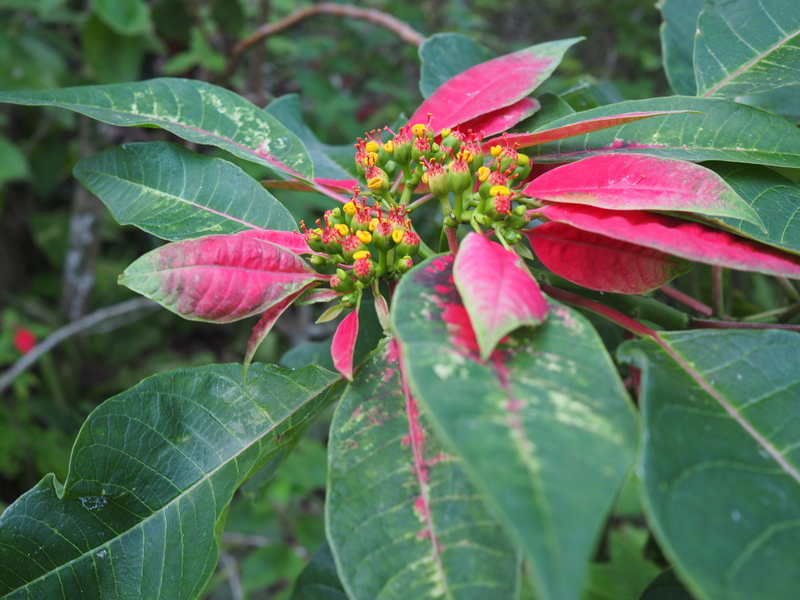 As we were leaving the gardens, I stepped on what I thought was a bindi. Turns out, it was actually a fire ant nest. 1000+ fire ants (not an exaggeration) crawled and covered my feet like some sort of plague. It was scary. In a weird panic and in response to excruciating pain, I jumped onto Vincent’s back like an olympic high jumper with my legs elevated in the air as he and random strangers frantically rubbed the fire ants off my legs and feet. I know why they are called fire ants. It felt like my feet were literally on fire! Ants off, I was left with chicken pox-looking feet and legs. Vincent pulled some leaves off a particular tree, crushed them, and placed them all over my legs and feet. It was soothing. 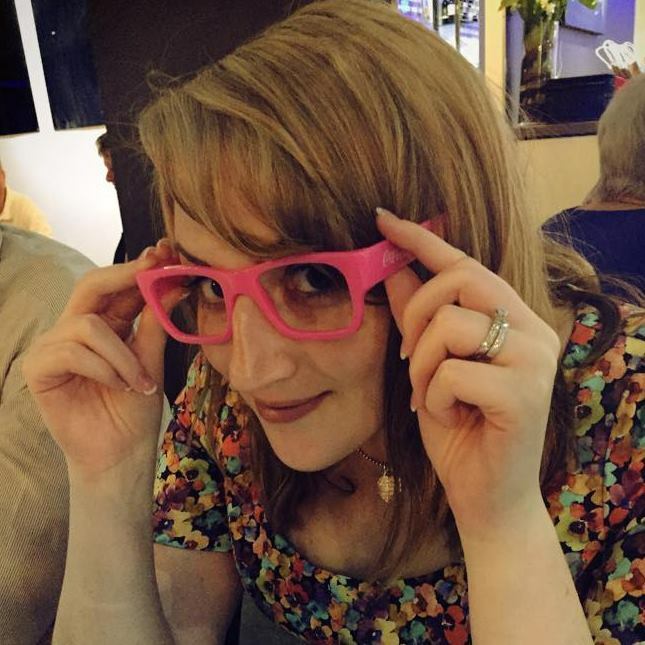 Drama over, my legs were then doused with alcohol (I can only assume that it was rum). It was definitely an authentic Jamaican experience! We boarded the bus again to travel to our next destination, Harmony Hall, a gallery featuring local Jamaican art and pottery. Mum and I both bought pottery of a lady carrying fruit on her head. The building was gorgeous. 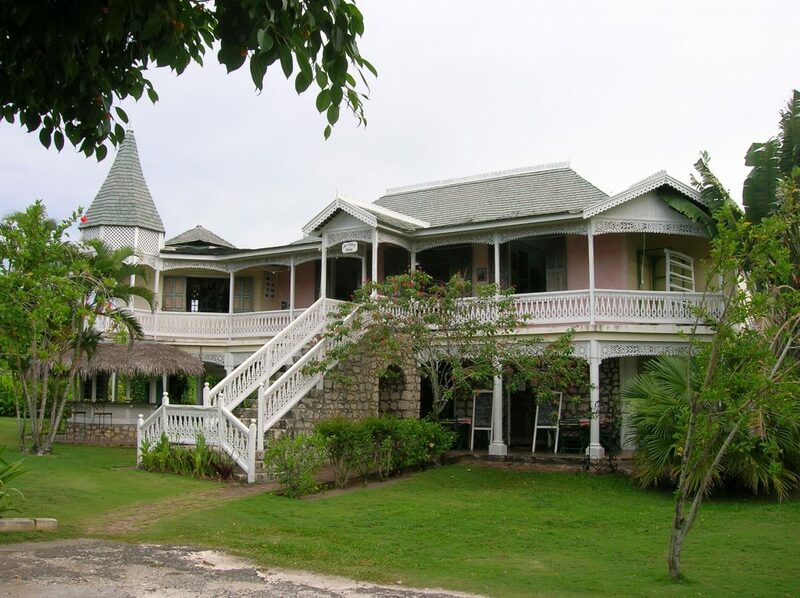 Harmony Hall, Ocho Rios, Jamaica. 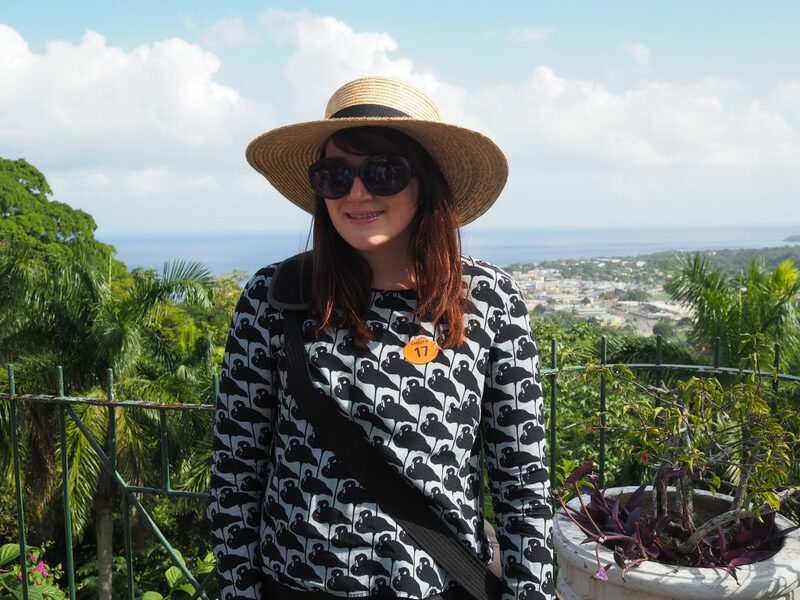 We made another stop to a shopping district before arriving at our final destination, Dunn’s River Falls. 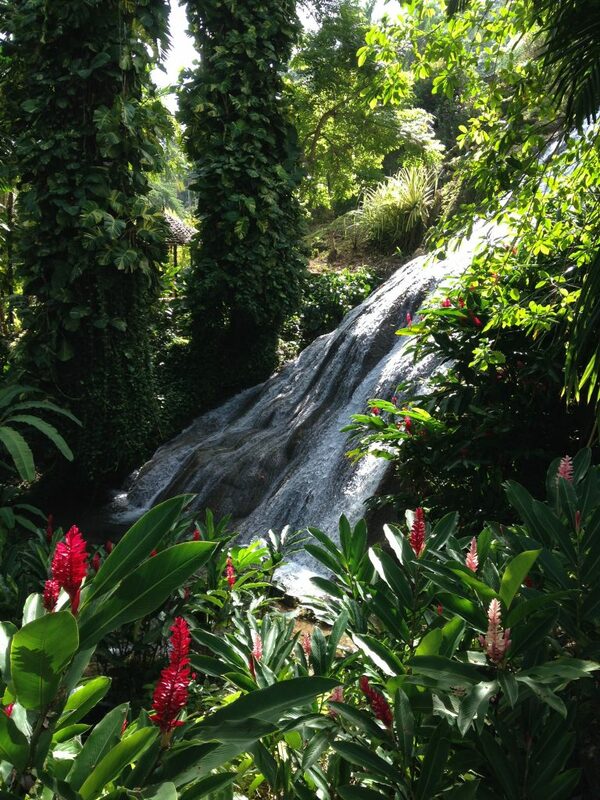 Dunn’s River Falls, Ocho Rios, Jamaica. We watched the waterfall for a while before heading back to board the ship. Today was our final day at sea. Which meant more eating, sleeping, drinking cocktails, relaxing and repeat. 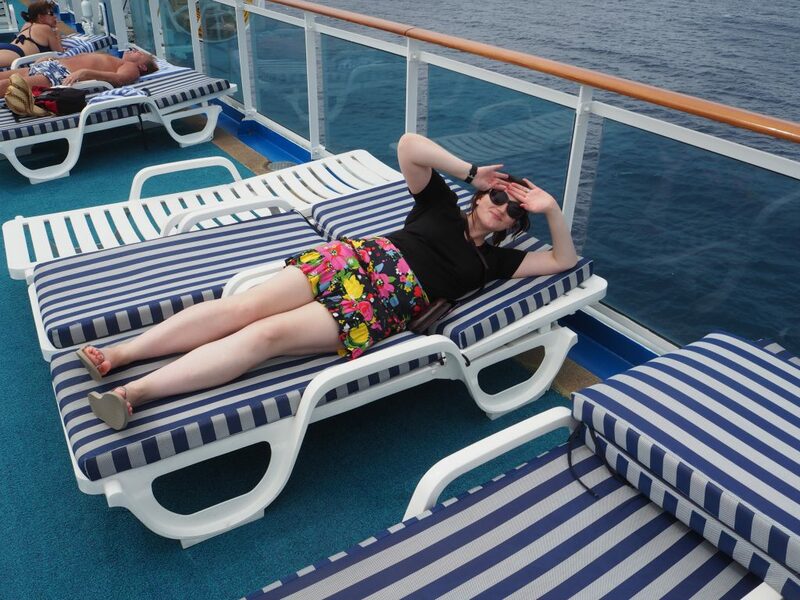 Just chilling on the cruise. 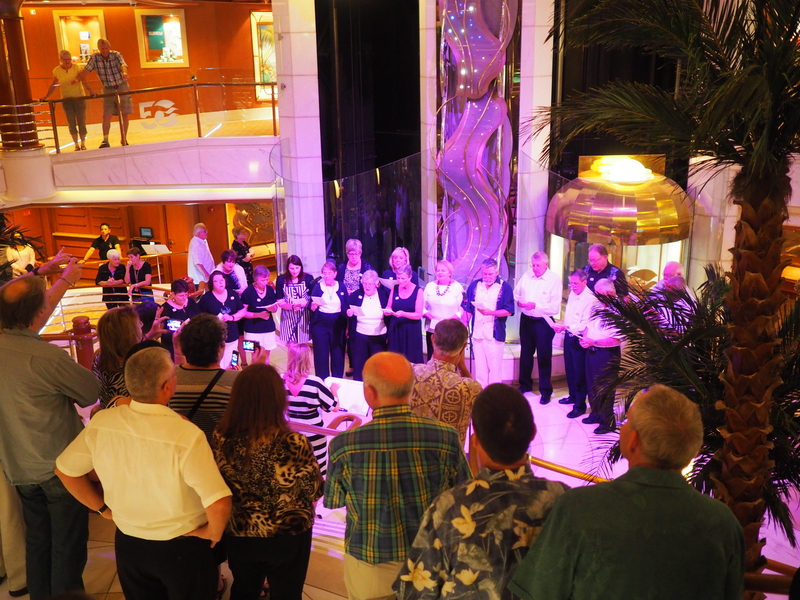 It was also the day of our big performance singing Sound of Music songs in the atrium of the cruise ship. It was fabulous. Sound of Music Pop Choir performance. By evening, it was again time to drink some cocktails and play trivia. The topic for this evening was centred around the USA. As three Aussies, in a ship full of Americans, we knew that we were doomed. We did not know a single answer to any question. We guessed EVERY single answer since it was multiple choice. By some kind of fluke, we managed to win trivia by far with a final score of 15 out of 20. We won a bottle of champagne and left the room of bitter faced members of the other trivia teams. Our last dinner of the cruise had come, and it was time for something spectacular: THE BOMBE ALASKA. However, rather than being “da bomb”, the bombe Alaska was instead a bomb. The usual procession of waiters each holding a dome-shaped dessert on fire had been replaced with a very OH&S friendly procession of embarrassed waiters each sadly carrying a dome-shaped dessert with a fake tea light candle in the centre. It was a disappointment, and it just tasted like sponge cake with Neapolitan ice cream. Bombe Alaska. Those are fake candles. No fire at all. After an overnight sail, our cruise ship docked at Fort Lauderdale. 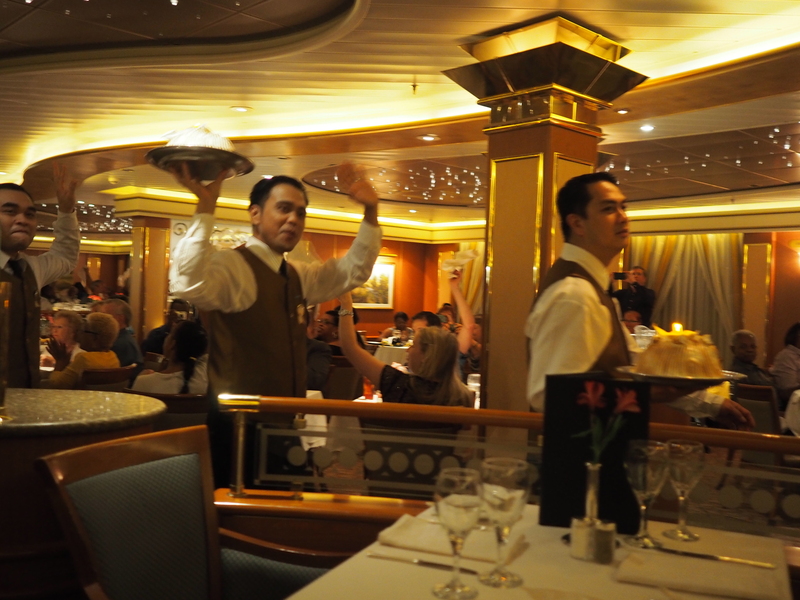 The Captain of the ship said his farewells on the loudspeaker before mentioning that over 147 tonnes of food was consumed on this cruise. 147 tonnes is equivalent to 20 Tyrannosaurus rex! That’s a lot of food! We left the ship, now with the thought that we should probably never eat again, passed through a number of slow security checks, before boarding our final flight home. We had made so many memories on this holiday with many special experiences that we will never forget.